Andrew Knight holds a sign of Pepe the frog, an alt-right icon, during a rally in Berkeley, Calif., on April 27. The demise of Pepe — who had become a symbol of the alt-right, neo-Nazis and white nationalists — was as sad as it was unlikely. Pepe, from the start, was supposed to be a good guy. But in the story of his rise and fall, some universal truths about the nature of modern Internet can be found. But first, let's look back at just how Pepe came to be. When Furie created the character in 2005 and later featured him in the comic Boy's Club, he was just trying to make a chill bro who happened to be an animal. "He's a 20-something post-college roommate," Furie told NPR. "He's an anthropomorphic frog that lives with a party wolf, a bear-like creature, and then kind of a muppety, dog-like creature ... in a one-room apartment. And [they] kinda just party together and pull pranks on one another and hug each other and that kind of thing." Furie said the characters were loosely based on his life, "living with a bunch of guys," and that "Pepe the Frog's more of just the Everyman. He likes to take naps and smoke weed, play video games." Pepe really took off with one particular comic strip, depicting the frog pulling his pants down all the way to his ankles to urinate. After one of his roommates called him out, Pepe replied, "Feels good man." A star was born. And then, that same star was coopted, stolen by a 4chan fringe. 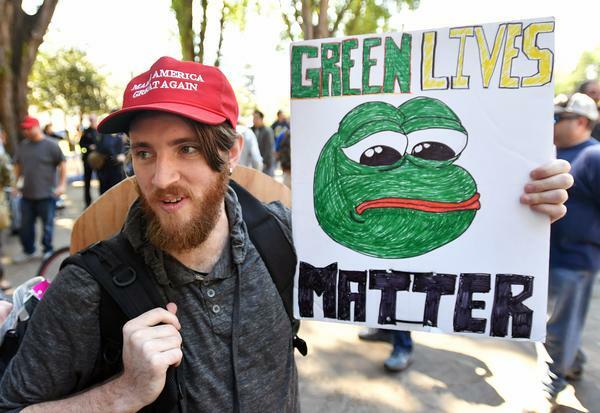 In an effort described to the Daily Beast as a push to "reclaim Pepe from normies," a dedicated group of 4chan users began to tie Pepe to white nationalism beginning around 2015. "We basically mixed Pepe in with Nazi propaganda, etc. We built that association," one user told Daily Beast reporter Olivia Nuzzi. And during the 2016 election, that fringe ended up successfully tying Pepe to Donald Trump. "Eventually, a popular meme of the smug frog with Donald Trump's hair started circulating online and then eventually got retweeted by the Donald Trump campaign," said Matthew Schimkowitz, an editor at Know Your Meme. "When that happened, the meaning of Pepe as kind of a white nationalist or alt-right symbol kind of exploded. It was considered by many to be a tactic of dog-whistling from the Trump campaign to that sect of white nationalists online, and it became a new symbol for white nationalists maybe not online. It essentially amplified that specific meaning of Pepe." But what happened next was telling. Donald Trump's opponent, Hillary Clinton, publicly denounced Pepe, and that only strengthened Pepe's connection to white nationalists, proving that a lot of times online, denouncing something can function as an amplifier. "I didn't notice anything until there was a Hillary [Clinton] explainer," Furie said. Schimkowitz added: "Because such high-profile people — perhaps the two most famous people on the planet — were saying in so much that Pepe is a symbol of the alt-right, that became the kind of meaning for the meme entirely. It's what we call here the Pepe effect. When everyone starts using a meme to mean one specific thing, that essentially becomes the meaning of it." Furie fought hard to change it. He wrote an essay in Time magazine, to reclaim Pepe. There was a Save Pepe campaign, complete with links to a Save Pepe online shop on Furie's Tumblr. Furie even partnered with the Anti-Defamation League to get Pepe back from white nationalists. Clearly, none of this worked. "These trolls, or whatever you wanna call them, they're kinda like the loudest voice on the Internet," Furie told NPR, a few days before he killed off Pepe. Strangely enough, Furie said he made the comic that killed Pepe off just a few weeks after the election, even though it just published online this past weekend. Furie said he had thought about killing Pepe long before the alt-right stole him. "Honestly, I thought about killing off Pepe just simply when he became a meme, before it was even associated with hate speech," Furie told NPR. "When an artist loses control of their creation, it's never that great." But he said he's not sad about the trajectory of Pepe's life. The demise of Pepe the frog is particularly sad when compared to the fate of the Internet's other famous amphibian: Kermit. That Muppet character has blossomed over the last year as a tea-sipping, real-talk-providing voice of humor and reason, with a good heart. Perhaps part of why Kermit lived while Pepe died is that Kermit was defined in the culture long before the Internet. From the start, Jim Henson made him lovable. Not so with Pepe. This frog wasn't etched in the public consciousness before the alt-right got a hold of him. "It basically says that things without very specific meaning can be changed pretty much in an instant," Schimkowitz said. "If a word isn't clearly defined, it can then kind of morph. Memes kind of work the same way." Schimkowitz compares Kermit the Frog to Superman, in that both characters have definitions that existed long before the Internet, personas that will likely never change, and might face backlash if anyone tried. "In the last couple of Superman movies, there's been a lot of outcry about how dark they made the character," he said. "He wasn't necessarily saving anybody, which is pretty much the opposite of what everybody knows about Superman. "Superman wasn't doing Superman," Schimkowitz said. "Kermit has that, too. People are so familiar with these characters, that they're not just going to suddenly forget their entire lifetime with them and accept something new." And that's where Pepe failed, if his takeover by the alt-right could be considered his fault. The frog white nationalists wanted him to be was a stronger character than the one Furie did. And if that's the case, the worst version probably always wins. Even now, the alt-right seems to be having its way with another symbol: the "OK" hand gesture, though the jury's still out on whether it's becoming a hate sign, or just being used to troll mainstream news outlets. Either way, chances are, given enough time, it too will morph into something bad, not something better. The moral arc of the Internet is long, but it usually bends towards awful. A cartoon frog died on the Internet a few days ago. His name was Pepe. You might remember him over the course of the 2016 election. He became one of the most recognizable symbols of the alt-right. NPR's Sam Sanders tells us how Pepe lived and why he had to die. SAM SANDERS, BYLINE: Let us begin with Pepe's birth. The year - 2005. Pepe's creator - an Internet artist named Matt Furie. MATT FURIE: So he's a frog. He's an anthropomorphic frog that lives with, like, a party wolf, a bear-like creature and then kind of a muppety (ph), dog-like creature. SANDERS: These were all characters in a comic Furie created. It was called "Boys Club". FURIE: Pepe the Frog is more just kind of like the Everyman. He likes to take naps and smoke weed and, you know, play video games - that kind of thing. SANDERS: (Laughter) Feels good, man. A star was born. For years, Pepe thrived in the quirkier corners of the Internet. You could make him whatever you wanted - Pepe as "Mona Lisa," Pepe as a unicorn, Pepe in jail, whatever. He was then all that is right with the Internet - fun, communal, malleable, weird. But then Pepe was stolen by the alt-right. MATTHEW SCHIMKOWITZ: He eventually kind of got co-opted by 4chan message boards. SANDERS: This is Matthew Schimkowitz. He's an editor at a website called Know Your Meme. Oh, and 4chan is an online bulletin board. SCHIMKOWITZ: And they would just kind of put him into various kind of either racist or anti-Semitic images under a different variation of the meme called Smug Frog. SANDERS: These alt-right right folks and white nationalists, they eventually got their racist Pepe variations into the presidential election. SCHIMKOWITZ: Eventually, a popular meme of the Smug Frog with Donald Trump's hair started circulating online and then, eventually, got retweeted by the Donald Trump campaign. SANDERS: That made Pepe as hate symbol even bigger. And then Hillary Clinton called Pepe out. There's this moment in a speech she gave last September where she's denouncing the alt-right. And, well, you got to hear it. SANDERS: Did you hear that guy who screamed Pepe? Well, Hillary Clinton's speech kind of did the same thing. It gave the alt-right, and Pepe, a big boost. FURIE: You know, I didn't notice anything until there was a Hillary explainer that was issued about Pepe the Frog and the alt-right and all that stuff. SANDERS: That's right. Matt Furie, Pepe's creator, did not realize his frog had turned racist until Hillary Clinton said so. The subtitle of that Clinton explainer, quote, "that cartoon frog is more sinister than you might realize." Furie tried to take the frog back. He launched a Save Pepe campaign. He even partnered with the Anti-Defamation League to rescue his frog - didn't work. So over the weekend, in a comic strip published online, Pepe croaked. The strip had images of Pepe in a casket, with his roommates pouring liquor over his face and drinking the rest. Furie says he actually wrote that months ago. And he told me over Skype that he had thought about offing Pepe long before the alt-right stole him. FURIE: Honestly, I thought about killing off Pepe just simply when he became a meme. When an artist loses control of their creation like that, it's never that great. SANDERS: But Pepe is still all over the Internet. So then, is Pepe dead or not? He's never really dead, huh? FURIE: It's a cartoon character. SANDERS: Just a cartoon character - or maybe a whole lot more. Sam Sanders, NPR News. (SOUNDBITE OF HOTDAY AND THE DREAMTEAM'S "ITS REAL") Transcript provided by NPR, Copyright NPR.